Willis Grew up in Las Vegas, Nev. She went to design school in Los Angeles, but returned to Vegas to work. She found a job at the Western Neon sign company, where she had plenty of work designing signs, such as the sweeping sparkling logo for the Moulin Rouge Hotel or the rather buxom blue angel for the Blue Angel Motel. “I got criticized for depicting a super-well-endowed angel,” she remembered years later. “I said, ‘Well show me an angel, and I’ll draw her.’” What happens in Vegas …is usually torn down within a few years, but Willis’ designs have tended to endure: her Blue Angel still stands, even though the motel is long gone. The Moulin Rouge sign is preserved in the Vegas Neon Museum. And so is her best-recognized design: the “Welcome to Fabulous Las Vegas” sign that is so popular, the county had to build a parking lot for tourists wanting to be photographed in front of it, or couples wanting to marry under it, officiated by an Elvis impersonator. As casinos come and go, or are at least remade into ever-larger temples for the money-changers, the sign, completed in 1959, remains, and has become an icon of the city. So much so, it’s listed in the National Register of Historic Places. Why is “Fabulous” part of the sign? “There was no other word to use,” she said in 2008. 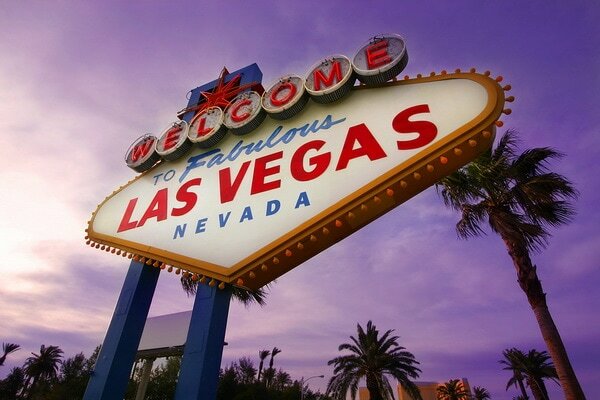 “Las Vegas was fabulous, and we wanted to advertise that.” She didn’t register a copyright or trademark on the sign. “It’s my gift to the city,” she said. “People from all over the world ask about it.” Willis died April 19. She was 91. Note: You can also see photo of the still-standing Blue Angel here.